Does Heinz’ Recycling & Its “Environmental Stewardship Strategy” Go Far Enough? Ketchup packets as we know them may soon be a thing of the past. That’s because the Kraft Heinz Company has announced that 100% of its packaging globally will be recyclable, reusable, or compostable by 2025. The Chicago-based food mega-corporation acknowledged in late July 2018 that the time had come to partner with experts, organizations, and industry coalitions to develop Heinz recycling practices for all its packaging. But are the new sustainability measures of Kraft Heinz and other corporations enough? Many Kraft Heinz products, such as the ubiquitous ketchup packet, Capri Sun juice pouches, and individually wrapped Kraft Singles, currently can’t be recycled through regular municipal programs. Multi-laminate packaging uses both foil and plastic, which isn’t able to be separated with common recycling methods in practice. Indeed, and unknown to many people, environmental deficits continue to negate the efficacy of recyclable products. People in the US only recycle about 66 million tons of material each year, according to figures from the Environmental Protection Agency (EPA) — or about 34.6% of everything that could be recycled. That means 2/3 of all US materials are thrown in landfills. Most plastics in circulation today don’t decompose in a human lifetime, so landfills grow with plastics debris, and grow, and grow, and grow. The majority of plastics are made from hydrocarbons derived from natural gas, oil, and coal. Plastics are chains of molecules called “polymers” that are linked together. Polymers often are made of carbon and hydrogen and sometimes oxygen, nitrogen, sulfur, chlorine, fluorine, phosphorus, or silicon. Lightweight. Strong. Able to be molded, extruded, cast, and blown into seemingly limitless shapes and films or foams. Drawn into fibers for textiles. Plastics seem kinda cool at first glance, right? Well, plastics and their byproducts are littering our cities, oceans, and waterways and contributing to health problems in humans and animals. Durable and very, very slow to degrade, plastic materials that are used in the production of many products, ultimately, become waste that lasts and lasts. Our contemporary, tremendous attraction to plastic, coupled with an undeniable behavioral propensity of increasingly over-consuming, discarding, littering, and polluting, has become a combination that is slowly eating away at our planet. 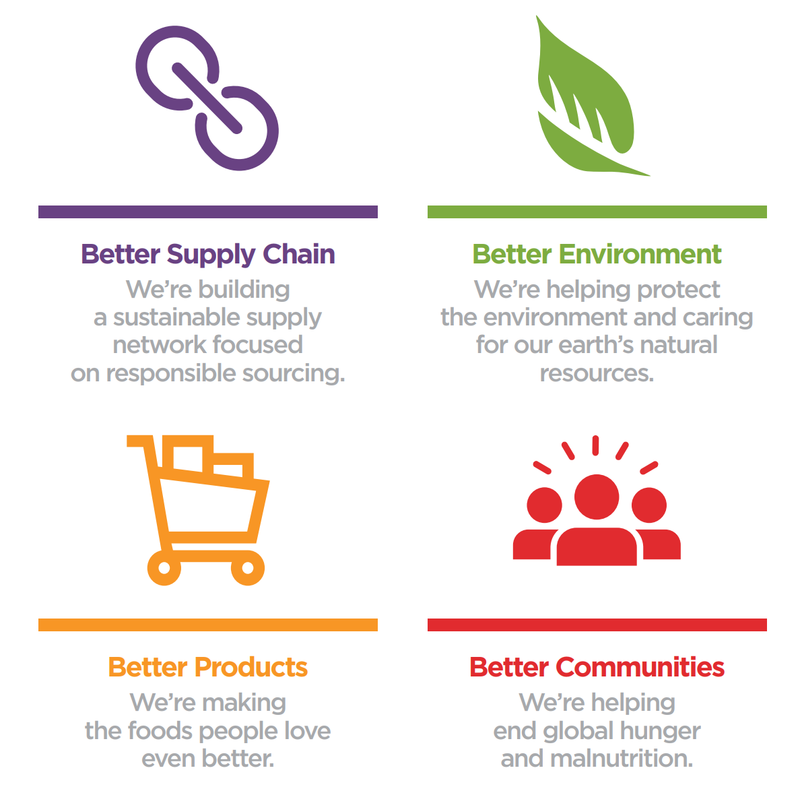 As part of its commitment to reduce natural resource needs and manage its overall environmental footprint, the Kraft Heinz Company is expanding its environmental stewardship strategy to include “time-bound targets for achieving greater packaging sustainability” as well as “setting science-based goals to reduce greenhouse gas emissions.” The company’s first Corporate Social Responsibility Report, which was released in 2017, acquiesces to shareholder environmental and social concerns. Such concerns could have an impact on the long-term success of the Kraft Heinz business empire. Finding greener alternatives has become trendy of late in the corporate world, with more and more companies seeking options — including biodegradable ones — for single-use packaging and dishware. Kraft Heinz joins other major food and consumables labels like Unilever, Procter & Gamble, Nestle SA, and Colgate Palmolive that have pledged within the next few years to meet target deadlines so that their products are sustainable and reduce plastics waste. Starbucks announced in July 2018 that by 2020, it will be eliminating plastic straws from its 28,000 stores worldwide. That means around a billion less straws every year will be in circulation and going to landfills, which will help to reduce plastic contamination of the world’s oceans and save marine animals from severe infections, blockages in their digestive system, and even strangulation. Analysis from IHS Markit reports that the current market value of biodegradable plastics exceeds $1.1 billion in 2018 and could reach $1.7 billion by 2023. These plastics — known more precisely as biodegradable or compostable polymers — are bio-based or fossil-fuel-based chemical compositions that undergo microbial decomposition to carbon dioxide and water in industrial or municipal compost facilities. Many biodegradable and compostable products are made out of plants and fibers that naturally break down and can even give back valuable resources to the earth. A few of these polymers have the capacity to decompose in backyard compost bins or in soil, freshwater, or saltwater. While the new Heinz recycling plan is a nice public declaration about responsible use of natural resources, any plastics packaging must be considered for their environmental and human health impacts on a long-term basis in what’s come to be known as “material efficiency.” Recyclability just isn’t enough anymore. The EPA, for example, is thinking beyond waste in its Sustainable Materials Management (SMM) approach, which refers to the use and reuse of materials in the most productive and sustainable way across their entire life cycle. SMM conserves resources, reduces waste, slows climate change, and minimizes the environmental impacts of consumable materials. Kraft Heinz isn’t sure yet how it will address non-recyclable and non-reusable packaging, like ketchup packets. Heinz redesigned the 50-year-old squeezable foil-and-plastic packet in 2010 to a larger “dip & squeeze” cup, which reduces waste but still can’t be recycled due to its film cover. New packaging will have to balance sustainability with requirements for food safety, shelf life, distribution, cost, and appearance, Krajewski acknowledged. Both consumers and investors in the past few years have pressed Kraft Heinz to overhaul its packaging. 13% of shareholders supported an investor proposal at the annual meeting in April 2018 that asked for analysis of the recyclability of its packaging. The company is collecting data to build a baseline level of how much of its packaging is recyclable and compostable and plans to disclose that information, Krajewski said. The option to develop packaging that is biodegradable or compostable is not that far-reaching. For example, TIPA, an Israel-based company, is making 100% compostable packaging film. “TIPA films look like plastic and behave like plastic but end life like an orange peel,” says Merav Koren, marketing director for TIPA. Bioproducts derived from bioresources can also replace many of the fuels, chemicals, and plastics that are currently derived from petroleum. Sustainable packaging and socially responsible business practices are the ultimate goals for companies to truly become green. Corporate Social Responsibility (CSR) brings together global citizenship, environmental stewardship, and sustainable development. As an apparent shift in values that involve internalizing “externalities,” CSR identifies today’s growing need for environmentally friendly packaging designs and materials. It is driven by an increasing number of global packaging standards, mandates, and take back fees. Increasingly, corporations are responding to meeting or exceeding these requirements through internal environmental stewardship and design-for-environment policies. Recycling is an important part of responsible living but is only one method of waste disposal. Organic waste is best dealt with by composting, whether on the small scale in a backyard or on the large scale in huge composting plants. Corporations like Kraft Heinz are making a good start when they consider the recyclability of their packaging, but it’s only a beginning in a long road to mitigating waste. A healthy waste management attitude looks at everything from the products purchased to methods for disposal of each item. Composting treats the material in a natural manner and gives back to the earth the materials that initially came from it. It certainly helps in soil remediation as well as enrichment and avoids causing any kind of soil erosion. Moreover, it doesn’t contribute towards pollution, which is one serious point of concern with landfills.